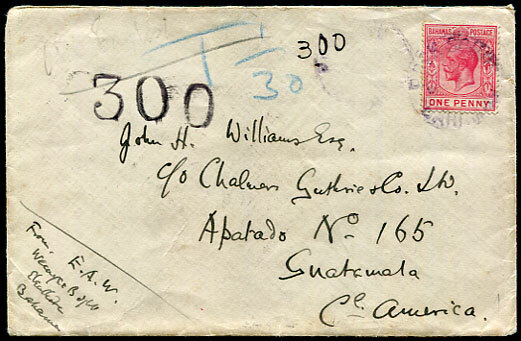 1923 underpaid cover from Wemyss Bight, Eleuthera to Guatemala with KGV 1d pmk'd purplish ROCK SOUND cds with indecipherable date with blue crayon tax mark and handstruck local charge "300" due, reverse Nassau 9 NOV 23 and NOV 30 receiver. 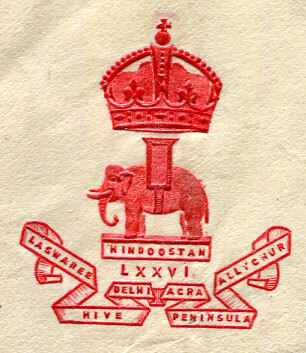 1927 reg. 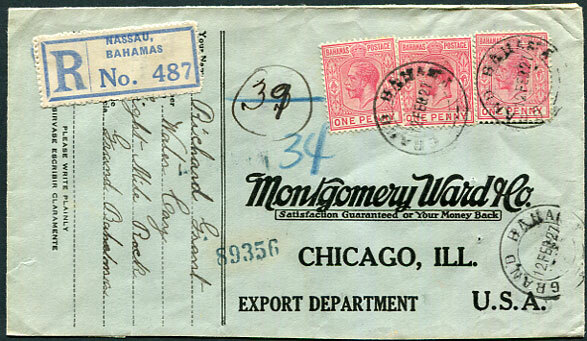 letter from Water Cay, Eight Mile Rock to Montgomery Ward, Chicago with 3 x KGV 1d pmk'd GRAND BAHAMA (T.3) dated 12 FEB 27. 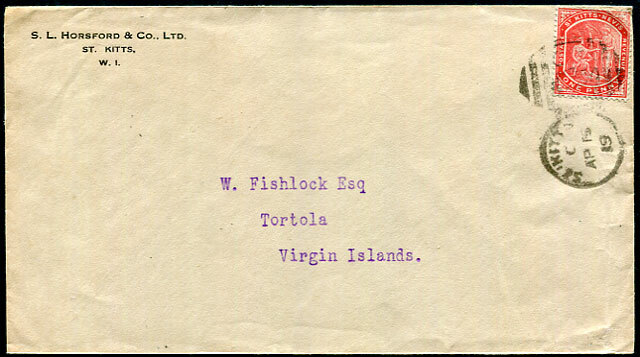 In 1926 a local mail service by small boat started from the island of Eight Mile Rock to Water Cay, 40 miles north with 150 inhabitants (Proud handbook Page 173). 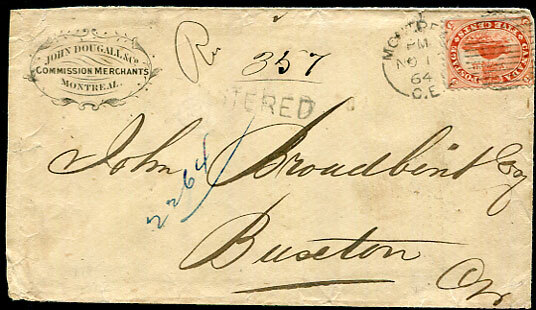 1864 cover from John Dougall & Co., Commission Merchants to John Broadbent in the very small community of Buxton, Ontario with handstruck REGISTERED and 5c Beaver (for postage, reg. fee paid in cash) pmk'd Montreal NO 16 64, reverse Hamilton NO 17 and Chatham NO 18 transits. South Buxton is south of Chatham U.C. and has a current population of 78, there being three roads and a church. 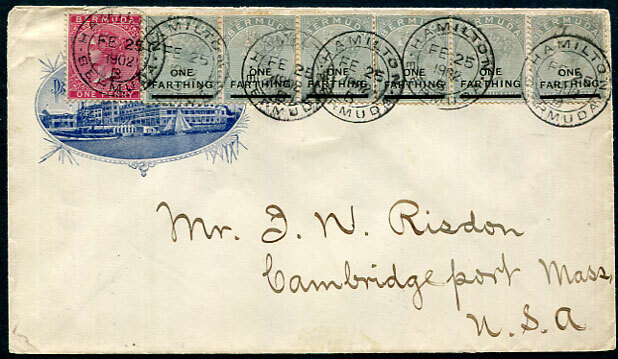 1902 illustrated Princess Hotel cover to Cambridgeport, Massachusetts with two pairs and single ONE FARTHING on QV 1/- dull grey and QV 1d carmine tied HAMILTON FE 25 1902 d/rings, arrival backstamps. 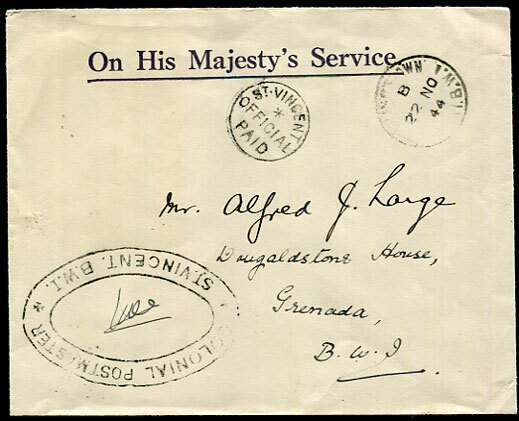 1944 OHMS stampless cover to Grenada with COLONIAL POSTMASTER sender's cachet, OFFICIAL PAID handstamp and Kingstown B/22 NO 44 despatch cds, arrival backstamps. 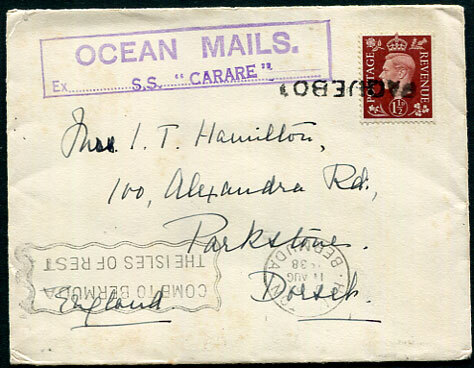 1938 Elfers & Fyffes (E & F blue flag printed flap) cover to Parkstone, Dorset with GB KG6 1½d tied PAQUEBOT handstamp, alongside boxed purple "OCEAN MAILS./Ex.... S.S. "CARARE" cachet off-loaded with Hamilton machine dated 11 AUG 1938. 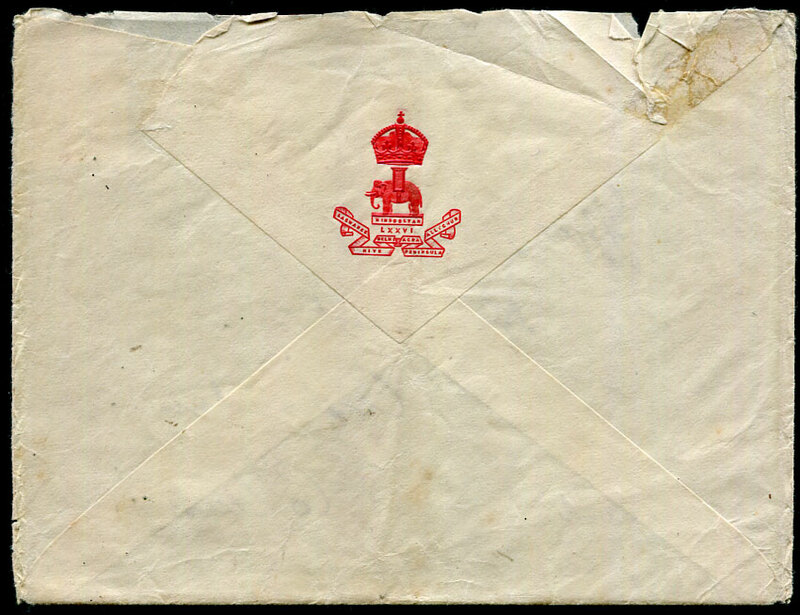 1866 entire with printed colourless embossed DUMMETT & Co. BARBADOS letterhead to E.H. Fitt & Co, Trinidad with 6d orange-red (SG.30) tied Bridgetown "1" bootheel with top flap displaying MR 6 66 despatch and Trinidad MR 8 1866 arrival, left frontal crease with central split. 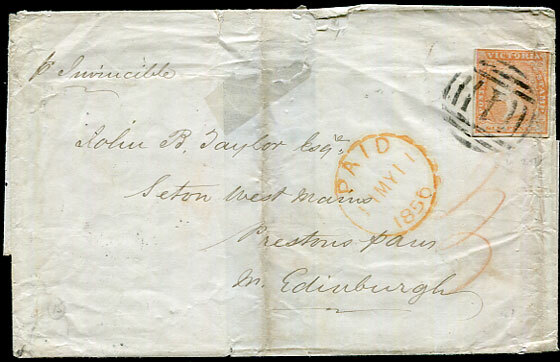 On DE 1 1862 Barbados and Trinidad had agreed to abolish the collection of 1d from both sender and addressee, this prepaid 6d adhesive comprised 1d to port, 4d sea post, 1d delivery. 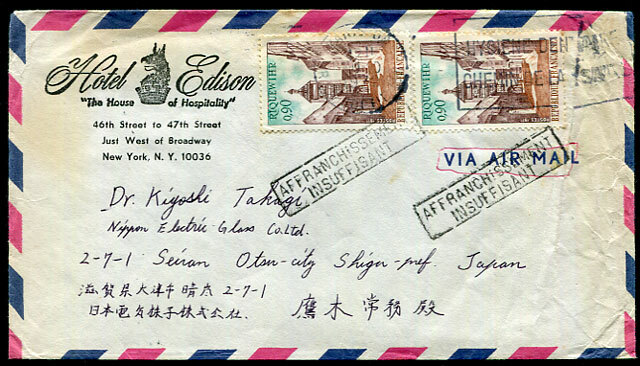 1970's Hotel Edison, New York airmail cover used in France to Japan, some soiling etc. 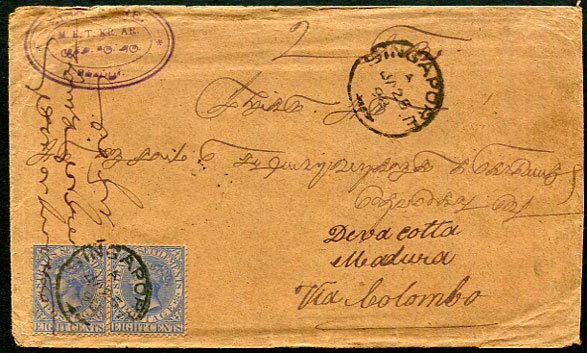 1898 cover marked "via Colombo" to Deva cotta, Madura, (India) with QV 8c x 2 pmk'd Singapore A/JA 25 98 with NEGAPATAM 2 FE 98 and DEVAKOTA FE 5 98 backstamps. 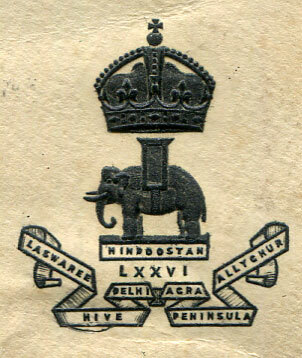 1940 reg. 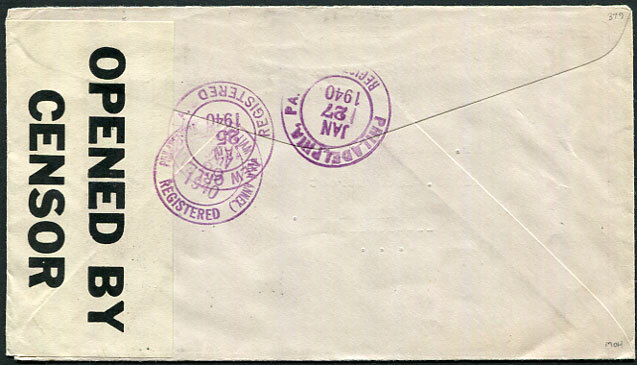 and censored cover from THE FRENCH PHILATELIC AGENCY, Belize to Philadelphia with mixed reign (genuine stamps) franking KGV 2c x 3, KG6 1c, 3c pmk'd Belize 19 JA 40, backstamped New York (JA 25) and Philadelphia (JA 27). Raoul de Thuin, a prolific stamp forger, dedicated half a century managing his skills to relentlessly fleecing the gullible, the knowledgeable, and mostly unsuspecting philatelists, and The French Philatelic Agency, P.O. 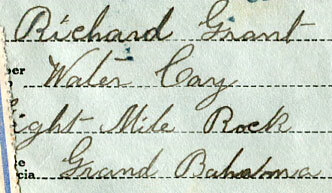 Box 206, Belize was just one of numerous aliases used to circumvent the spotting by the U.S. Post Office of his fraudulent activities to particular persons or firms. 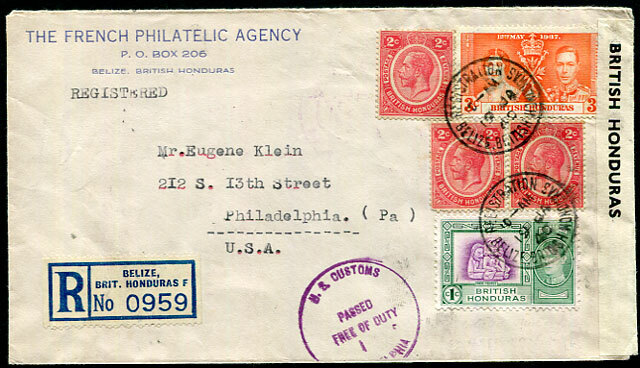 De Thuin (born Belgium 1890 died Guayaguil, Ecuador 1875) started his philatelic “work” as early as 1916 having a shop in Brussels in 1927. He entered Mexico in 1931 on the run from French and Belgian police who wanted him forgery. He was expelled from Mexico for setting up a forgery ring and moved to Tegucigalpa, Honduras where he was jailed and expelled in 1936 and then lived in Belize until moving back to Mexicio in the early 1940’s where he settled until 1968 when he moved to his wife’s home in Guayaguil. He specialised in forging overprints of Central and South American countries, especially Mexico, turning common stamps into rarities. He is quoted as saying that “I have no conscience at all at having deceived all those foolish people. They are just fanatics who neglect their families for their passion.” His method of sale was to use aliases to send sheets of approvals to collectors, mainly in the USA, which mixed a few genuine common stamps with forgeries of rarer items. Many collectors were duped and in 1962 a London sale of 498 lots of classic Mexico belonging to Prof. Hormer Lizama was cancelled when the sale was revealed to consist mainly of de Thuin fakes. 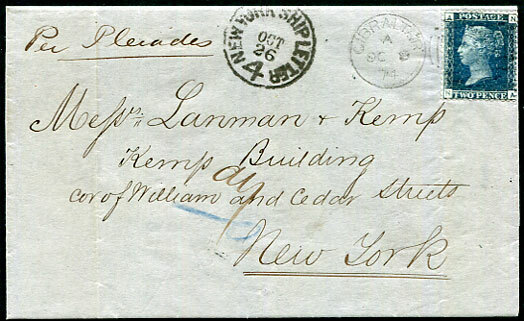 1874 printed headed entire by private ship "Pleiades" to New York with GB QV 2d blue pmk'd light "A25" duplex dated A/OC 9 74 landed with NEW YORK SHIP LETTER cds dated OCT 26 showing 4c to be collected. Ex METLISS, OSBORN, STIRRUPS. 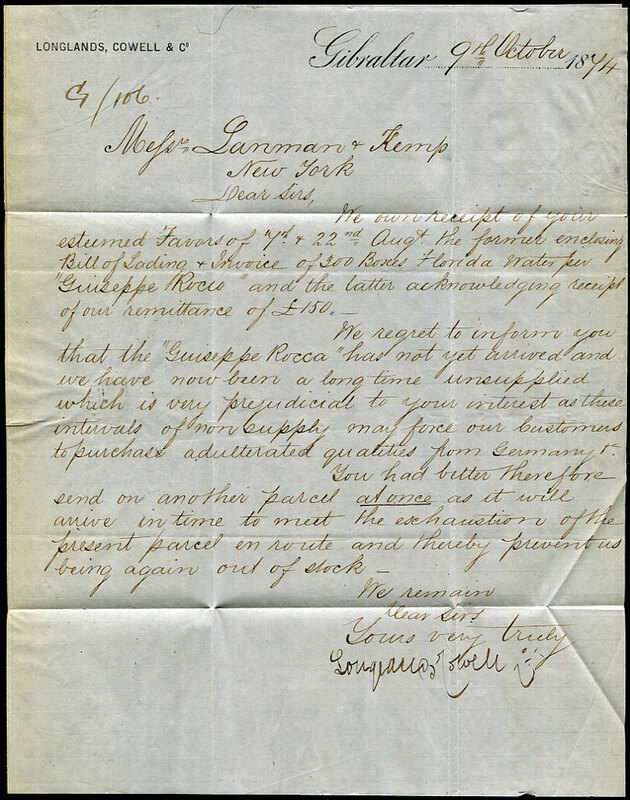 'Direct' ship letters to New York were quicker and cheaper than mails via Liverpool. 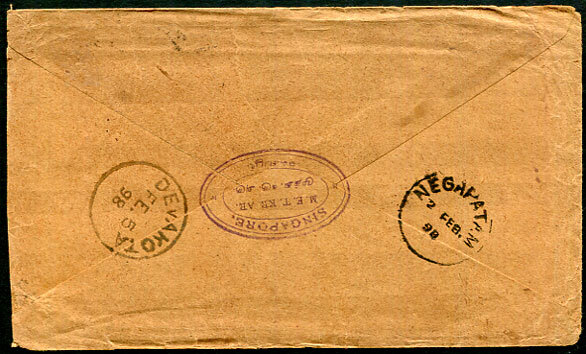 1939 cover with Jamaica Fruit & Shipping Co. Ltd, Kingston senders address marked "via St. Thomas, V.I." 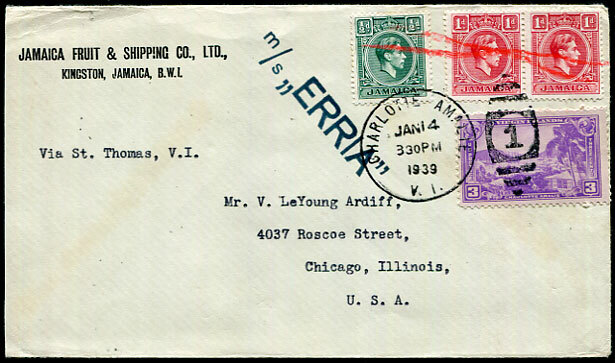 to Chicago, Illinois with Jamaica KG6 ½d, pair 1d carried on the first leg by m/s "ERRIA" and red crayon cancelled by the purser with second leg using U.S. Virgin Islands 3c pmk'd Charlotte Amalie "1" duplex dated JAN 14 1939. A rare two countries combination to destination. 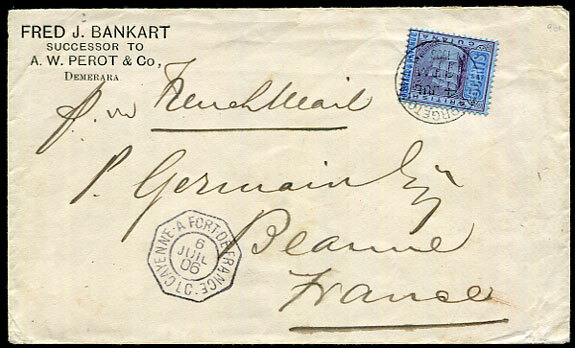 1906 with printed sender "FRED J. BANKART, SUCCESSOR TO A. PEROT & Co. DEMERARA" marked "p. French Mail" to Beaune, France with 5c pmk'd Georgetown 4 JUL 1906, alongside octagonal d/ring CAYENNE A FORT-DE-FRANCE LC dated 6 JUL 06. There are strong links between the Perot's of British Guiana and Bermuda. 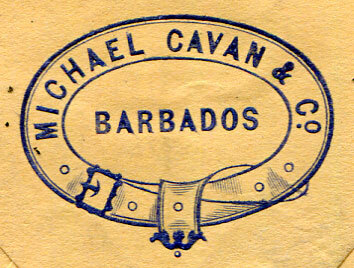 Covers from Demerara (1859) and Berbice (1872) are known to William H. Perot, Baltimore, son of the famous William Bennett Perot of Bermuda. Two 1833 entires from Demerara to Philadelphia have manuscript endorsement “Hamilton, Bermuda. Forwarded by Your Most Ob Servant Wm. 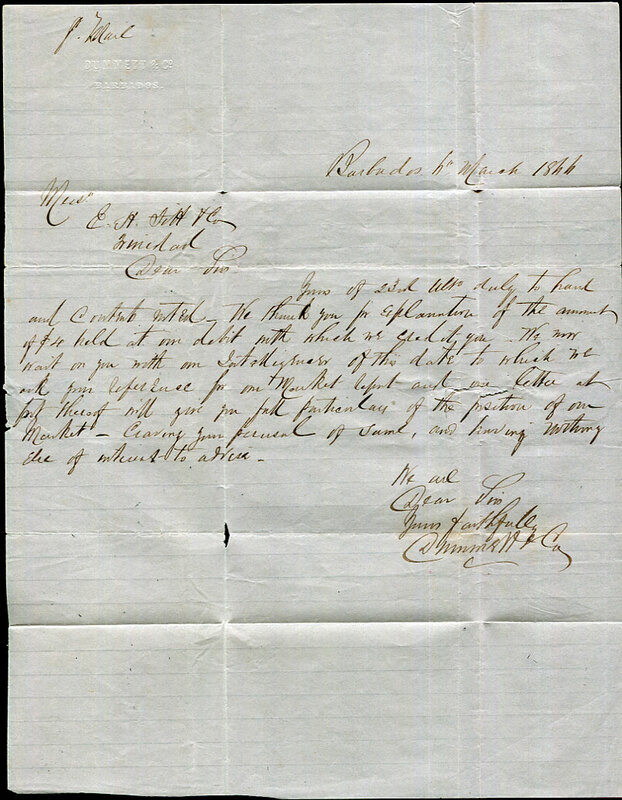 B. Perot” whilst working as a forwarding agent during the period before he was appointed Postmaster of Bermuda by warrant dated SP 6 1836. 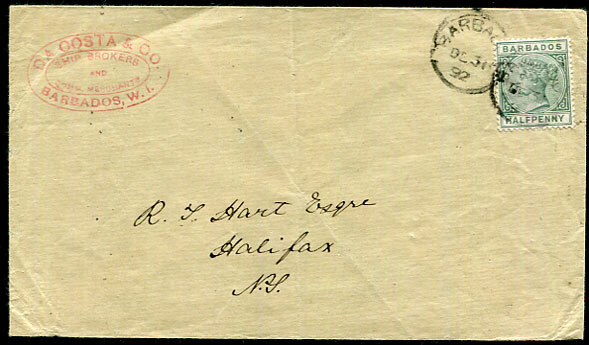 1892 cover with DA COSTA & CO. sender's cachet to Halifax, Nova Scotia with the unsealed rate paid by QV ½d pmk'd DE 30 92 cds, flimsy stock. 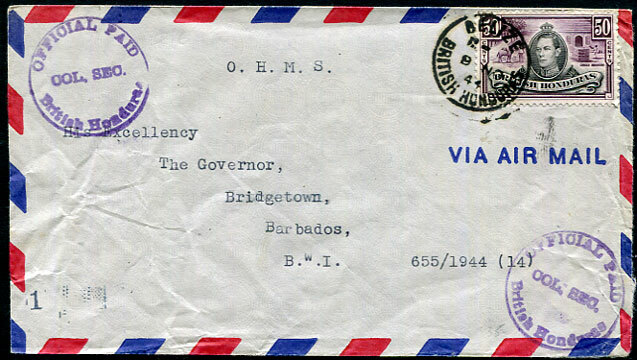 1944 cover to His Excellency The Governor, Bridgetown, Barbados with KG6 50c pmk'd Belize 9 NO 44 showing two purple OFFICIAL PAID/COL. SEC. 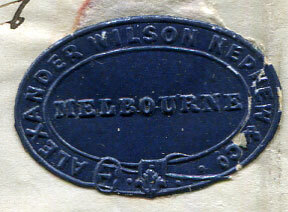 cachets and secretive "1" handstamp at lower left. 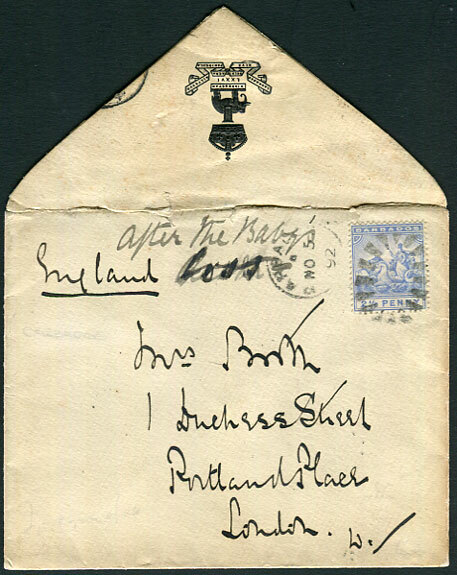 1892 cover to London with 2½d Seal pmk'd open bootheel duplex A/NO 5 92, the envelope flap skilfully backed for display of the regiments arms. 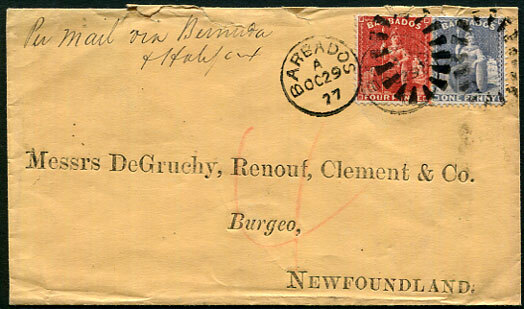 1877 Michael Cavan & Co. printed flap cover marked "Per Mail via Bermuda & Halifax" to Burgeo, Newfoundland with 4d deep red P.12½, 1d grey-blue P.14 (SG.68,74) pmk'd open bootheel duplex dated A/OC 29 77 showing red crayon "4" and St. Johns Newf'd NO 24 77 arrival backstamp, a little roughly opened along top. 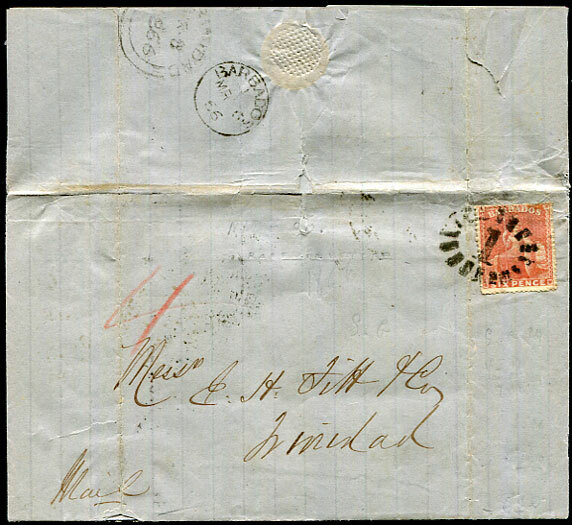 A single printing of 36,000 stamps of the 4d deep red P.12½ was invoiced JY 14 1875, currently only 6 covers are recorded bearing this stamp. 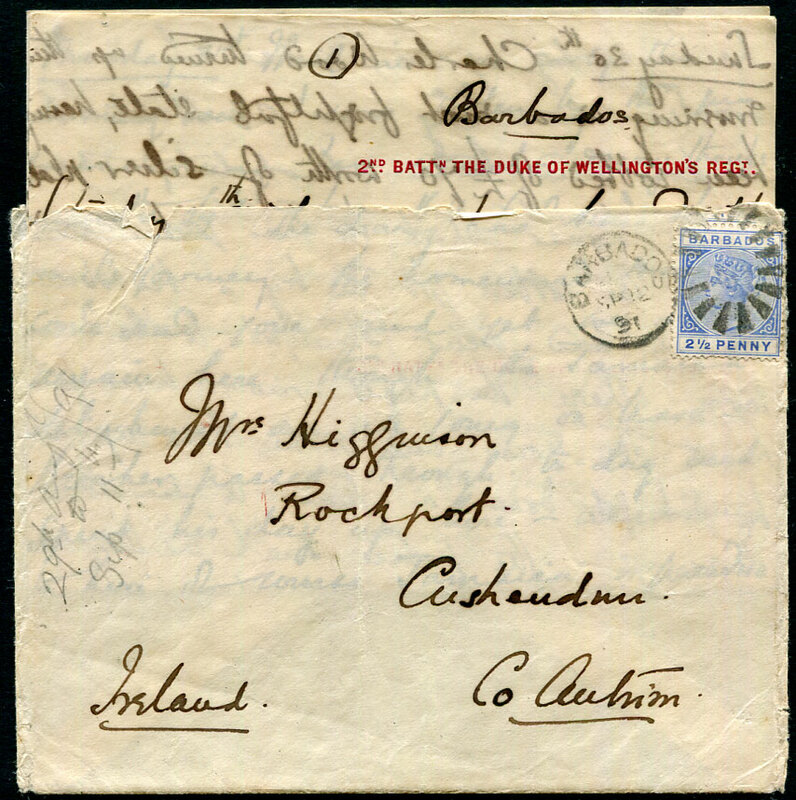 1891 QV 2½d rate regimental cover to Cushendun, Co. Antrim, Ireland pmk'd SP 12 91 duplex with neatly written 14 sides on 3 pages regimental note paper in the form of a diary spanning the period 14 days Saturday 29th August to Friday 11th September. Newsy contents mention loss of £70 worth of silver in a robbery, the subsequent capture of one of the robbers when he tried to sell some of the spoons to a jeweller, another of the garrison had up by the police for refusing to pay full fare on the railway, and additionally getting caught when he gave his A.D.C.s free pass to his sister, polo matches, guard duty, shooting of braces golden plover, long legs and chirps, and taking the ponies for a swim and their rapid exit due a nearby blue shark. There is also mention of sketches of the glens of Antrim by the English artist and author Rose de Crespiguy.